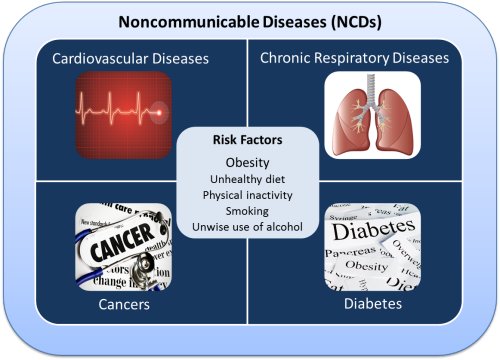 Overweight and obesity are major risk factors that contribute to the development of NCDs. Nutrition in early life (even before birth) is known to contribute to the development of overweight, obesity and vulnerability to NCD risk. Increasing rates of overweight and obesity in childhood and adolescence are leading to more people developing NCDs from a younger age. It is know that increasing fruit and vegetable consumption reduces a persons risk of NCDs. In particular, eating fruit and vegetables reduces the incidence of deaths from cancers and cardiovascular diseases. The World Health Organization (WHO) recommends that children and adults eat AT LEAST 2 servings of fruit and 3 servings of vegetables everyday. A study from University College London involving more than 65,000 participants between 2001 and 2008 has shown that eating more fruit and vegetables decreases a persons chance of dieing from cancers and cardiovascular disease. This study demonstrated that the benefit of increasing fruit and vegetable consumption continues to more than 7 portions a day. The paper describing this study is available in open access from the Journal of Epidemiology and Community Health. A short video suitable for use with classes describes the results of this study very well and creates a good starter activity for a discussion on fruit and vegetable consumption. Sugars should make up less than 10% of total daily energy. Keeping sugar intake to 5% of daily energy (6 teaspoons per day) is recommended for additional health benefits by the World Health Organization (WHO). Sugar sweetened beverages (SSBs) are a major source of sugar for children and young people. This includes any beverage that has sugar added e.g. soda drinks such as cola, flavoured milk drinks, cordials, sports drinks and many drinks labeled fruit drink/juice that have added sugars. The American Heart Association recommend no more than 450kcal of energy should come from sugar sweetened beverages each week. That is fewer than 3 cans of carbonated soda per week. FiZZ - Fighting Sugar in Softdrinks. The website of this health-education partnership programme offers a summary of recent research into sugar consumption and health, particularly in Pacific settings. Daily physical activity is recommended to support health and wellbeing at all ages. Physical activity includes play, games, sports, dance, transportation, chores, recreation, physical education or planned exercise in the context of family, schools and community activities. There is a dose-dependent relationship between physical activity and health and wellbeing. Increasing physical activity at all ages improves metabolic and cardiorespiratory health, and reduces the risk of obesity, hypertension and related NCDs. Every week, adults should do at least 150 minutes of moderate intensity aerobic physical activity, and 75 minutes of vigorous intensity physical activity. For additional health benefits, adults should increase their physical activity to 300 minutes of moderate activity and 150 minutes of vigorous activity per week. Muscle strengthening activities should be done on at least 2 days per week. Children and young people should do at least 60 minutes of moderate to vigorous physical activity every day. Doing more physical activity will provide health benefits. Most daily physical activity should be aerobic. Vigorous activities, including those that strengthen muscle and bone should be included at least 3 days per week. For further information and details of the World Health Organization Global Recommendations on Physical Activity for Health, click here.